The final session of the National Cutting Horse Association (NCHA) Futurity Sales was held on Saturday, Dec. 10, in Fort Worth, Texas. A large crowd was on hand for the NCHA Futurity Cutting Horse Sale, which had 100 head of trained performance horses cataloged and saw two horses sell for more than $100,000. The highest seller at $140,000 was Magic Metallic, a 2010 mare who had earnings of $128,537 through October. In her limited-age career, Magic Metallic won the West Texas Classic Open, finished third in the Abilene Winter Derby Open, The Ike Open Classic, Arbuckle Mountain Classic Open and Bonanza Classic Open, and was a finalist in several major aged events. Magic Metallic was consigned by Fults Ranch, which owns her sire, Metallic Cat. She is out of the Abrakadabracre daughter Sweet Abra, who has produced earners of nearly $700,000. Several of Sweet Abra’s offspring are full siblings to Magic Metallic, including Metallic Rebel ($195,124), Sweet Metallic ($157,607), Magistic Moon ($79,253), Magic Metalman ($47,289) and Metallilac ($10,916). It’s not often that buyers get a chance to bid on a World Champion, but that’s exactly what happened when Hip No. 6020, Mercedes Smoothe, walked into the ring. The 2009 mare had been ridden by Gavin Jordan to the 2016 NCHA $25,000 Novice World Championship. Consigned by Reata Cutting Horses, she sold for $100,000. On sale day, Mercedes Smoothe had earnings of $148,900, according to the NCHA. The Smooth As A Cat mare is out of $112,127-earner CDs Masterpiece, by CD Olena. Mercedes Smoothe is a full sister to CDs Smooth Cat ($15,376) and a half-sister to NCHA Eastern National Championships Non-Pro Champion Hickorys Indian Macy ($101,375, by Hickorys Indian Pep), NCHA Futurity Open finalist Andreya ($53,906, by Dual Rey), National Reined Cow Horse Association Snaffle Bit Futurity Open finalist Thiscatsamasterpiece ($18,175, by WR This Cats Smart) and others. Many of the consigned horses were aging out of the limited-age ranks, including Hip No. 6041, 2010 mare Stylin Sweetie. 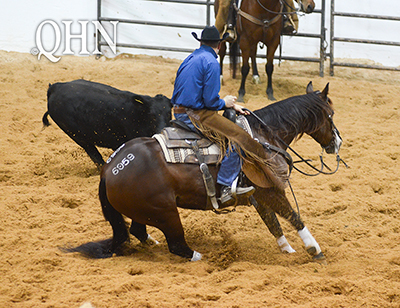 John McClaren consigned the Stylin Cat mare, who was the third-highest seller at $80,000. An earner of $97,807, Stylin Sweetie is out of the Smart Little Lena mare Salute This, a winner of $125,647. Stylin Sweetie is a full sister to $10,000-earner Ezzy Stylin Cat and a half-sister to Cat On A Mission ($39,966, by High Brow Cat), Debbie Does Ft Worth ($14,922, by Playgun) and Smart Lookin Lucky ($12,475, by WR This Cats Smart).